Have you ever been in a meeting that got way off track? Or, have you sat in a meeting that had an agenda that was not effective? Have you sat in a meeting that was a great meeting where a lot was accomplished but you didn’t even need to be there? These are all perfect ways to make a meeting fail. There are three things that will make a meeting fail quicker than anything else. Don’t prepare an agenda so no one knows what you are supposed to talk about. When a meeting doesn’t have an agenda, you have set up the meeting to fail. People will show up having no idea what the purpose of the meeting is. Without an agenda you will not know how much time to talk about each item. Ultimately, failure to have an agenda will lead to a failed meeting. Don’t invite the right people to the meeting and you will be sure to have the meeting fail. Prior to the meeting you shouldn’t invite the people that will be able to make decisions. Don’t invite the key stakeholders to the meeting. Also, don’t invite the people that will be affected by the outcome of the meeting. You will certainly set up the meeting to fail by not having the right people present. In line with not having an agenda and inviting the wrong people, allowing the meeting to get off topic is an easy way to get the meeting to fail. Sometimes there are people that will certainly ramble about their area of expertise. They will bring up other projects unrelated to the meeting and they will distract others from the purpose of the meeting. By allowing people to do this, the meeting will be a complete failure. Meetings are a very important and time consuming part of the work week. 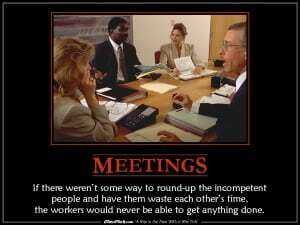 If you will follow the steps above, your meetings will definitely be failed meetings. What other suggestions do you have to fail a meeting? Please share your comments in the comments section below.